ENGLAND 1968 Richard Long (1945 – )	P5640 © Richard Long. All Rights Reserved, DACS 2015. 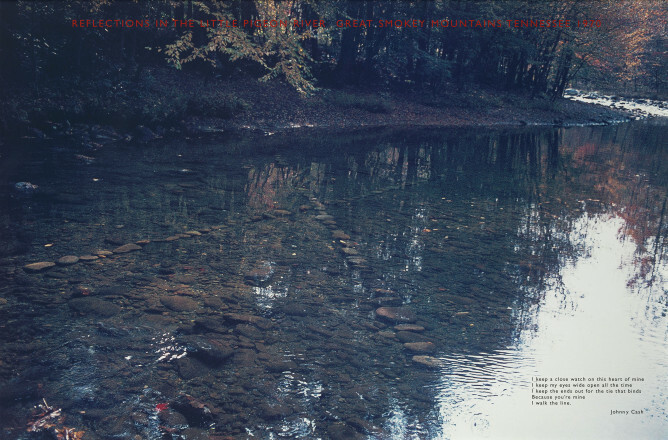 REFLECTIONS IN THE LITTLE PIGEON RIVER (GREAT SMOKEY MOUNTAINS, TENNESSEE) 1970 Richard Long (1945 – )	P8147 © Richard Long. All Rights Reserved, DACS 2015. 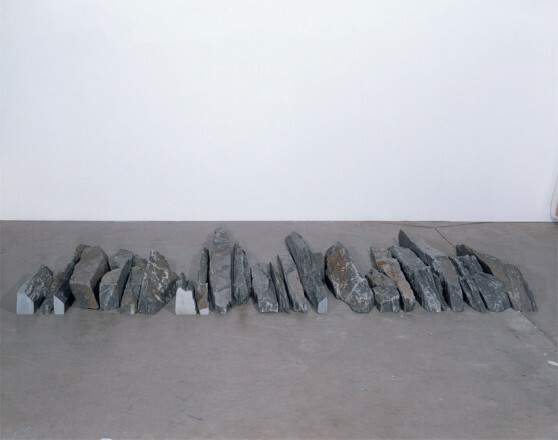 STONE LINE 1979 Richard Long (1945 – )	P3876 © Richard Long. All Rights Reserved, DACS 2015. 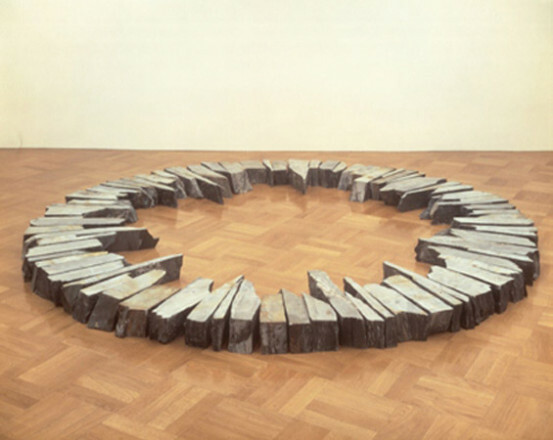 CIRCLE IN AFRICA 1978 Richard Long (1945 – )	P5641 © Richard Long. All Rights Reserved, DACS 2015. 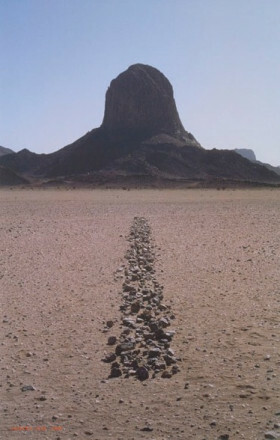 SAHARA LINE 1988 Richard Long (1945 – )	P7876 © Richard Long. All Rights Reserved, DACS 2015. 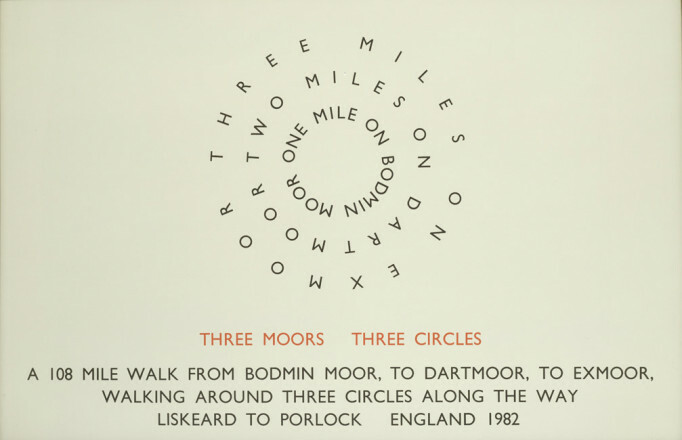 Richard Long was born in Bristol. He studied at the West of England College of Art, and from 1962 - 1965 at St Martin’s School of Art, London. He was awarded the Kunstpreis Aache, Neue Galerie-Sammlung Ludwig in 1988, the Turner Prize at the Tate Gallery, London in1989, and was named a Chevalier dans l’Ordre des Arts et des Lettres by the French Government in 1990. Long has his first solo exhibition at Galerie Konrad Fischer, Düsseldorf in 1988 and his work was shown at Tate St Ives in 2002. For almost four decades Long has made nature the subject of his work. He has said that his sympathies are close to both Arte Povera, "simple, modest means and procedures," and Conceptual Art, "the importance of ideas." Almost from the outset of his career, Long began working out of doors and using natural materials like grass and water: an early work from 1964 consisted of a snowball and the track it made when rolled. This in turn evolved into the idea of making sculpture simply by walking. 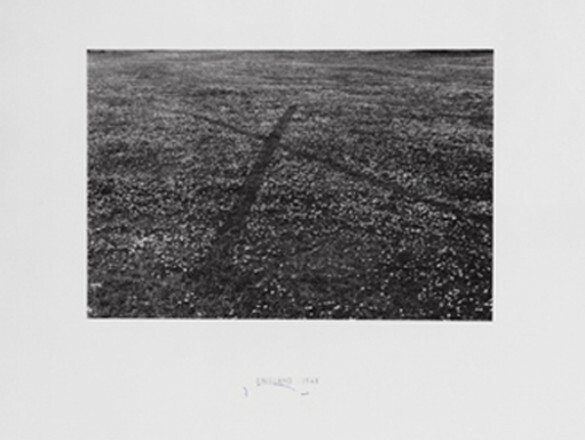 His first walking work was A Line Made By Walking, England 1967, a straight line in a grass field recorded as a photograph with text. His work expressed in walks has led to an extension of sculpture to include the passage of time and place, as his walks are recorded or described in photographs, maps or text works, using whichever he feels is the most appropriate for each different idea. In addition to which, he collects various materials found en route to produce work both within the landscape itself and in galleries. Long has said, "I am interested in the emotional power of simple images," and the materials which he finds are arranged in configurations such as circles and lines, which are "timeless, universal, understandable and easy to make." An important aspect of his work is that he disturbs the landscape very little. His outdoor sculptures, whether made by walking or placing stones or sticks, leave minimal evidence of his presence. Long has worked in some of the remotest landscapes in the world and, using the most economical of means, he has created a body of work which has transcended international boundaries and speaks in a truly universal language.